The story of Lamitek, made up of work and determination, innovation and continuous research, started in 2002, when Renato Crescimbeni decided to capitalize on the wealth of skills acquired through years of work in the world of engineering. Thus was born the Teknolam Ltd, today Lamitek Ltd, a company made up of men and Technology, Ideas and Crafts. 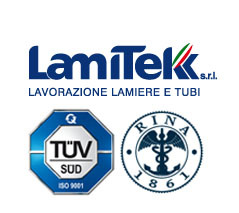 The Twenty years of experience of Mr Crescimbeni Renato and his outlook for the future, enabled the Lamitek Ltd to present herself as a valuable partner for its customers in various sectors of the automotive, agricultural equipment, agricultural and industrial machinery, furniture and prototyping. Proudly Renato Crescimbeni today can count on the collaboration of his son, Luca Crescimbeni, who from an early age showed a passion and dedication to the job in the Company, bringing more dynamism and activity and demonstrating good agreement with the father figure, his great reference. This added value increases the strength of Lamitek, giving it momentum, new energy and continuity. The advantages of this generational alliance make the company look to the future with serenity and trust, and give long live to the present with enhanced spirit of organization and innovation.